SuperPower is a new series of high performance heat sinks created by Pada Engineering in 1996. This special technology has been designed aiming at the dissipation of heat in electronic systems of any size and type using forced air. 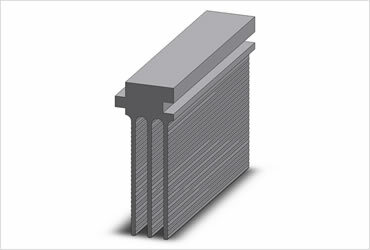 This hi-performance product has been studied by Pada Engineering R&D to design medium-high power electronic systems, considering that the extreme versatility of its performances allows to raise its efficiency, money-saving, thermal characteristics, flexibility and, at the same time, reduction of weight, volume and costs. UPS systems, medical instrumentation and military sector. 1) Modules are in aluminium alloy AW6060 as per standard EN 755 - 9. 2) The standard finishing is a simple washing (degreasing). 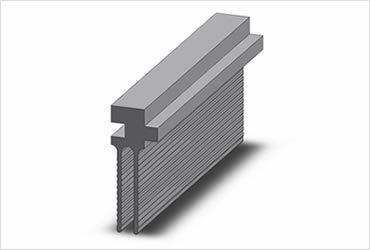 3) The flatness of the components assembling surfaces is of 0,01 mm/150 mm and the roughness Ra = 1.2 μm. The distinguishing caracteristic of SuperPower heatsink lies in the design. 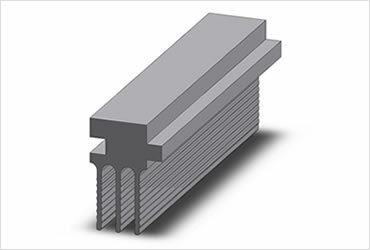 In fact, the SuperPower is made of different extruded fins which are assembled together according to specific customer requirements on sizes and thermal performances. Thanks to our special assembling technology – geometries and manufacturing processes are covered by an International Patent – fins form a reliable and compact unit whose high performances have been tested by many specialized laboratories. In particular, exhaustive cyclic tests under temperature and vibration, in full compliance with the IEC77 standard regulations, have pointed out excellent results. In fact, using a special resin, which is put between each fin base before assembling, an optimum mechanical resistance on the finished product is granted. 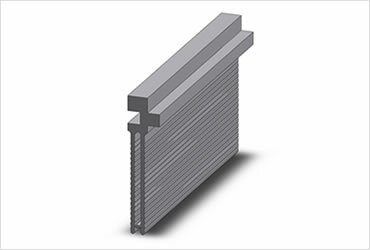 The torsional stress of each fin, after its assembling, has turned out to be of a resistance power equal to 12 kg/mm, while the maximum bearable load of the surface has turned out to be of 1,8 kg/mm² with no permanent damage. These values are absolutely equivalent to the ones of the extruded profi les. Therefore SuperPower have the same mechanical features of traditional heat sinks assuring even better thermal performances. Due to these reasons, we suggest to use the 4 mm pitch only when the application of the 6 mm pitch does not comply with the thermal requirements. These are not recommended for their efficiency and are used to obtain redundant systems. It’s possible to use indifferently an air thrusting or sucking system, considering that the suction system operates at an higher temperature (therefore it’s less reliable) but it’s noiseless. SuperPower can be assembled up to a maximum length and width of 600mm. We’re continuously developing the SuperPower concept; please contact us directly for any updating. All the specifications and characteristics mentioned above are subject to changes without notice. 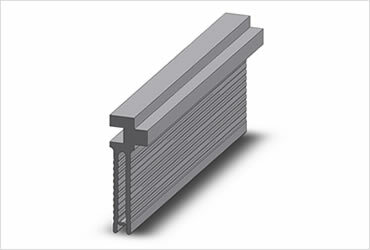 If tight tolerances on the width are requested, side walls for the series “T”, “G”, “D”, “H”, “C”, “M” and “P”can be assembled in the extremities, allowing the side milling to achieve the required width. The models of the SuperPower series, thanks to the above mentioned “assembling patented system” of the components - also thanks to their special design – can undergo any classical machining such as milling, drilling, screw thread with no problem at all. Machining is carried out in compliance with the EN 22768 /1- m regulations. All the assembling surfaces of the components are always milled so as to create a perfect assembling plane. Galvanic treatments such as anodizing are not recommended on SuperPower. 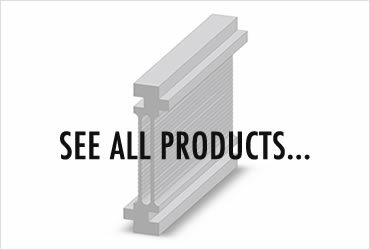 To use in forced ventilation, to reduce weight and volume and increase thermal features, compared with standard extruded profiles. High rate height/pitch fins. Do you need a custom quotation? Born in 1975, Pada is one of the world’s leading manufacturer of aluminium heat sinks serving customers all over the world. Our professional staff will respond to your requests.